Our Open Frame Surveyors Measure Tape is a professional tool. The entire design and body has been manufactured to withstand daily use and the rigors of environments such as construction sites. To ensure high visibility, the entire open frame has been printed with a neon yellow colour and clear black font. The lightweight and durable fiberglass construction has been chosen to allow for each transportation and storage when not in use. The purpose of this tool is to take accurate measurements required by surveyors when valuing a property and ensuring the building is compliant with relevant building requirements. A large, rubber padded handle allows the tool to be extended from one side. At the centre of the spool, a large plastic handle winds up to pull the measuring tape back into the compact, rolled design. The plastic, flexible tape body has been printed with bold black number and line markers. It can be used to measure up to 30m in centimetre increments or 100ft in inches. From professional to educational use, this open frame surveyors tape is an effective and useful tool to have on hand during every site visit. It can be carried on your person or stored with your tool kit to guarantee you always have what you need to complete your job. 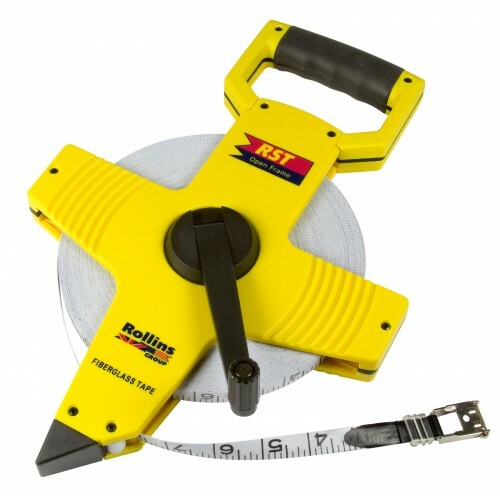 We can offer this measuring tool in larger, bulk quantities to suit your budget. For orders over 10, each item will incur an individual price of just £14.40. For orders over 100, each item will incur an individual price of just £11.28.